Many people consider the Ferrari 275 one of the greatest Ferraris of all time. With a V-12 motor and four-wheel independent suspension, it was a technological powerhouse of the 60s. Ferrari House from 1950 to 1966 produced different models of Ferrari 275 such as Ferrari 275 S, Ferrari 275 GBT, Ferrari 275 GTS, Ferrari 275 P, Ferrari 275 GTB for competitions, Ferrari 275 P2, Ferrari 275 GTB4. 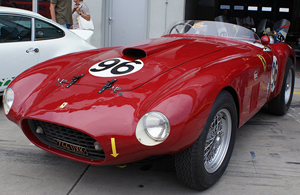 Find as follows some of our Ferrari 275 parts. For further information about ouf Ferrari 275 parts drop us a line.